Another brilliant weekend at Woodlands run by Smurf & Brummie (Jackie and Martin Dutton) was enjoyed by Heather, Lorraine, Janine, Penny, Pamela, Mike, Phil & Philip. We were joined by some of Brummie's mates and Kevin from the centre. 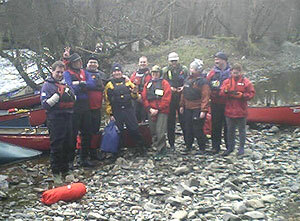 On Saturday we ran the Wye from Builth Wells to Boughrood, at a high and fast water level. The rain held off and we ran several exhilarating rapids, including the famous Hell Hole, which was the highest I'd seen it- the hole itself was overflowing and we shot the big bouncy V towards river left. Everyone did really well, we were assured that it was all easy II but on checking my guidebook Llanfared, Erewood and Hell Hole are all classed III, so well done to all!! Our evening meal at the Harp pub (where 2 of us had had a pleasant evening on Friday was disappointing- the Old Speckled Hen was off, as was the service and the Chicken & Mushroom pie with spicy peppers & white wine sauce. It was so bad Phil complained & negotiated a free pint, Penny deciding at this stage to switch tables to the latecomers who were less strident!!! We adjourned to the Hotel for more drink and relaxation. Sunday saw a brighter day and we ran the Usk from Talybont to Llangynidir Bridge. The put in was crowded and we met Riverside paddlers, Rob Yates, his dad Graham with wife Kathy, Glynn and Helen plus some younger ones. This time we split into two groups and as we went down practised buddying up to break in amp; out of eddies and ran a few easy rapids, before arriving at Mill Falls-again to me the highest I'd seen it and a n easy III at this level. It requires a high crossover/ferry glide to the left bank and then run along the left wall in big water. Great fun!!!! The day was turning into a glorious sunny run, and we paddled down to the take out just before the major rapids, but after a lovely long sweeping rapid run river left, at Llangynidir. After the bridge is a more difficult rapid which we decided to avoid as we wanted an early run back, though the loading of vehicles is fairly tedious as the car park is about a kilometre distant, and parking in the passing places is frowned upon!